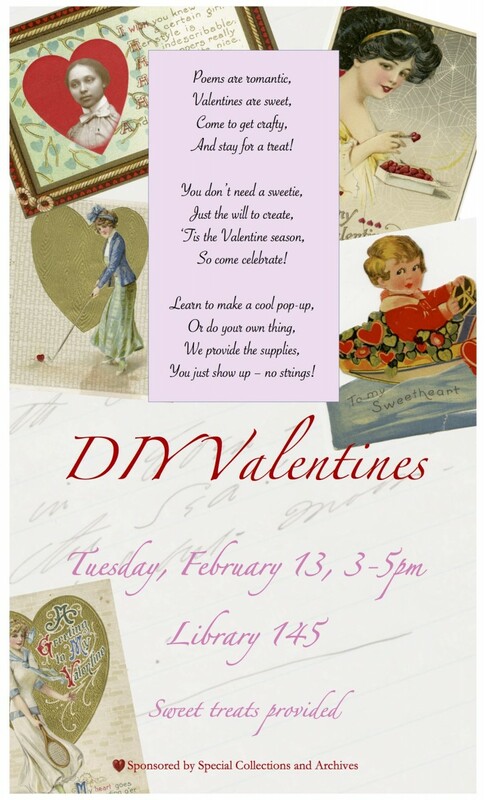 On Tuesday February 13th from 3-5pm, join us in Library 145 to make Valentines with inspiration from our collection of vintage postcards, poems from the Abernethy Collection of American Literature, and vintage topographic maps. Otter Creek Bakery cookies will be provided! Make your own sausage-slicing dog butcher Valentine, complete with swinging hinged arm! New this year: dazzle your Valentine by making your card pop! Learn the Turkish Map Fold to showcase a love poem, original collage, or map to your heart. Plus, we’ll have information on upcoming book arts workshops this semester. Be sure to join our email list! This entry was posted in Post for MiddNotes on February 8, 2018 by Mikaela Taylor.